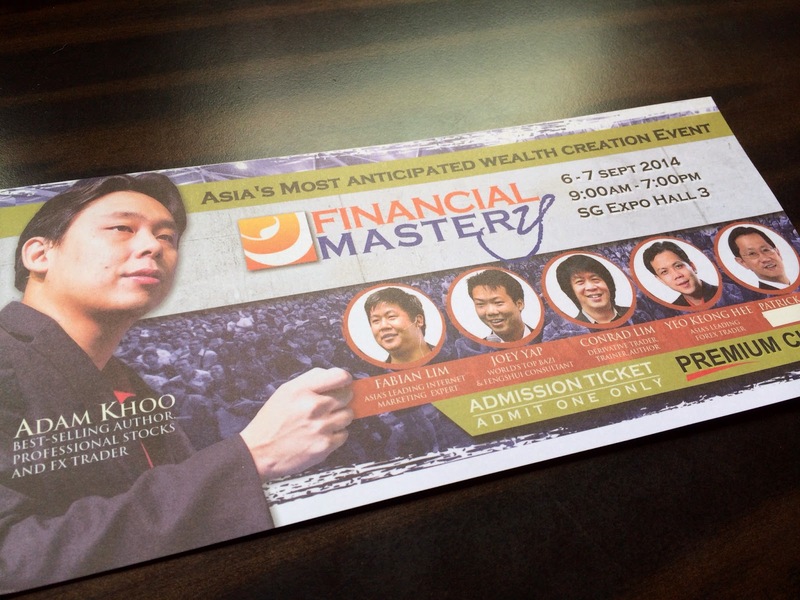 In about 6 days' time, will be attending the 2-days Financial Mastery 2014 seminar with a peer retail investor (Mr Lim). I've received the entrance ticket early this week and am looking forward to attend this "action-packed" 2-days seminar. For more details of these coverage, click here! Personally, this will just be my learning or knowledge grabbing phase. I am not expecting it to have immediate impact/change to my current investing philosophy (which is focusing on Fundamental Analysis and Capital gain). So, in summary, will try to learn as many strategies/tactics from the seminar as possible and review them whether it fits my preference/style or not. I am fully aware that investing is not one-size fits all kind of game. If you are attending the seminar next weekend and would like to say hello to me, feel free to email me at investopenly@gmail.com and we can get in touch during the seminar. I used to sit at the front row for such free seminars. Once I was caught on photo and appeared in the subsequent year Ads for the same seminar. Know where to sit and remember to ask more questions. Photographers may take aim at you.